You can tell by the look in her eyes - she's constantly judging other people's outfits, and her judgements are harsh! 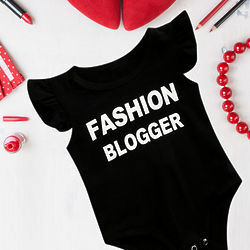 Give this cozy bodysuit to the world's tiniest (and most adorable) fashion critic. Let them Choose what they want with a Gift Card. Nike, Jordan, Adidas, Under Armour, Reebok, and more. Go Back to School Fashions and Trendy styles. Just What They Need!